ShortScale :: View topic - Short-scale Les Paul style guitar? 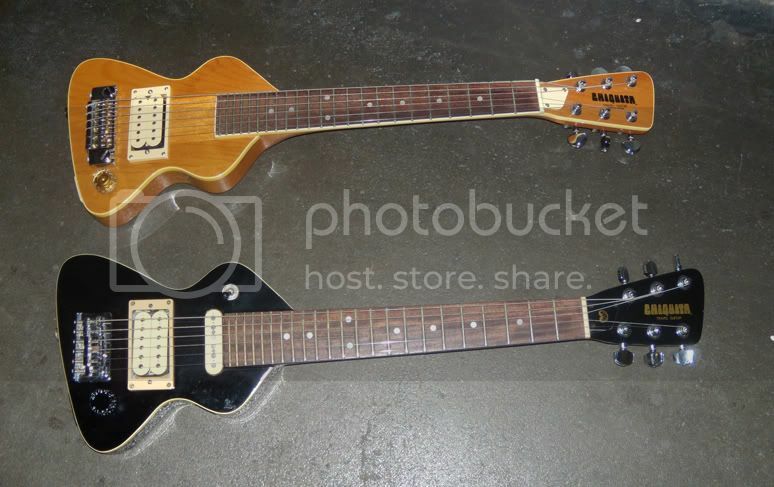 Posted: Sat Aug 15, 2015 7:47 pm Post subject: Short-scale Les Paul style guitar? Can someone please direct me to one? Seen any short SGs around? There was the Jaguar HH with a stop tailpiece. Doesn't look at all Les Pauley, and it's bolt on. But it is most of the way there. It's been discontinued, but you might find one. A Les Paul is short scale. How short are you talking? They made a shorter scale Gibson Melody maker too. You don't find them often though. I remember seeing others than the Special in the article, they also had hollow bodies and Melody Makers. A Les Paul is short scale. How short are you talking? Probably shorter than one of the two commonly accepted "standard" scale lengths for an electric guitar like 24.75"
...or shorter. Real deal shortscaling here...I was about to post about LP-shaped TOMO Electric Ukuleles, and oops too late. Gibson's real scale is 24.562", for some reasons they have been declared it as 24.75" (MIC Epiphones have real length of 24.75"). Difference between Mustang and Les Paul, while playing, may not be noticed, if nobody tells you that one fretboard is shorter than another. The term "shortscale" is the inside term for the exact company, like 24" is the shortscale for the standard scale of 25.5" for Fender, while the"full" 25.5" scale is shorter than the traditional scale of classical guitar which is 25.6". Gibson used to have 3/4 scale of 24.562" and Birdland that used to have the regular scale minus the first fret. Fender used to have wider range of shortscale models, so yeah, shortscale means either 24" or 22". Difference between Mustang and Les Paul, while playing, may not be noticed, if nobody tells you that one fretboard is shorter than another. Surely the crippling pain in the left shoulder would give the Les Paul away. There's also the Am. Special Mustang. I think it's been discontinued, but you can probably find a used one. PRS makes a great one, the 245 (24.5" scale). They're usually light and the PRS SE 245 is quite affordable at $499. You just have to get over the stigma of having a PRS*. * Yes, I have one, but mine doesn't have bird inlays.